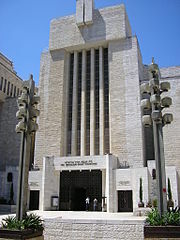 Religion in Israel is a central feature of the country and plays a major role in shaping Israeli culture and lifestyle. Religion has played a central role in Israel's history. Israel is also the only country in the world where a majority of citizens are Jewish. According to the Israel Central Bureau of Statistics, the population in 2011 was 75.4% Jewish, 20.6% Arab, and 4.1% minority groups. The religious affiliation of the Israeli population as of 2016 was 74.7% Jewish, 17.7% Muslim, 2.0% Christian, and 1.6% Druze, with the remaining 4.1% including faiths such as Samaritanism and Baha'iism, and irreligious people with no faith. Israel does not have a constitution. While the Basic Laws of Israel that serve in place of a constitution define the country as a "Jewish state", these Basic Laws, coupled with Knesset statutes, decisions of the Supreme Court of Israel, and various elements of the common law current in Israel, offer some protection for free practice of religion in the country. Pew Research Center has identified Israel as one of the countries that places "high" restrictions on religion, and there have been limits placed on non-Orthodox streams of Judaism. Legal accommodation of the non-Jewish communities follows the pattern and practice of the Ottoman and British administrations, with some important modifications. Israeli law officially recognizes five religions, all belonging to the Abrahamic family of religions: Judaism, Christianity, Islam, Druzeism, and the Bahá'í Faith. Furthermore, the law formally recognizes ten separate sects of Christianity: the Roman, Armenian, Maronite, Greek, Syriac, and Chaldean Catholic Churches; the Eastern Orthodox Greek Orthodox Church; the Oriental Orthodox Syriac Orthodox Church; the Armenian Apostolic Church; and Anglicanism. Relations among religious groups—between Jews and non-Jews, between Muslims and Christians, and among the different streams of Judaism, such as Orthodox, Reform and Conservative—are often strained. Israel, founded in the aftermath of the Holocaust, was created in the Jews' ancestral homeland to provide a national home, safe from persecution, for the Jewish people. Although Israeli law explicitly grants equal civil rights to all citizens regardless of religion, ethnicity, or other heritage, it gives preferential treatment in certain aspects to individuals who fall within the criteria mandated by the Law of Return, including preferential treatment to Jews and their relatives who seek to immigrate to Israel. The Law of Return does not strictly follow the traditional Jewish religious law (halakha) in relation to the definition of who is a Jew. For example, some individuals who would be considered Jewish under halakha are excluded from the rights under the Law of Return - e. g., those who converted to another religion; while others are entitled to immigration though they are not considered Jewish under halakha, e. g., they are related by marriage to a Jew or a grandparent may have been a Jew. As of 2009[update], 8% of Israeli Jews defined themselves as Haredim; an additional 12% as "religious"; 13% as "religious-traditionalists"; 25% as "non-religious-traditionalists" (not strictly adhering to Jewish law or halakha); and 42% as "secular" (Hebrew: חִלּוֹנִי, Hiloni). As of 1999[update], 65% of Israeli Jews believed in God, and 85% participate in a Passover seder. However, other sources indicate that between 15% and 37% of Israelis identify themselves as either atheists or agnostics. [unreliable source?] A survey conducted in 2009 showed that 80% of Israeli Jews believed in God, with 46% of them self-reporting as secular. Israelis tend not to align themselves with a movement of Judaism (such as Reform Judaism or Conservative Judaism) but instead tend to define their religious affiliation by degree of their religious practice. Of the Arab Israelis, as of 2008, 82.7% were Muslims, 8.4% were Druze, and 8.3% were Christians. Just over 80% of Christians are Arabs, and the majority of the remaining are immigrants from the former Soviet Union who immigrated with a Jewish relative. About 81% of Christian births are to Arab women. Most citizens in the State of Israel are Jewish. As of the end of 2015, Jews made up 74.9% percent of the population. In 2007, a poll by the Israeli Democracy Institute found that 27% of Israeli Jews say that they keep the Sabbath, while 53% said they do not keep it at all. The poll also found that 50% of the respondents would give up shopping on the Sabbath as long as public transportation were kept running and leisure activities continued to be permitted; however, only 38% believed that such a compromise would reduce the tensions between the secular and religious communities. What would be called "Orthodox" in the diaspora includes what is commonly called dati ("religious") or Haredi ("ultra-Orthodox") in Israel. The former term includes what is called Religious Zionism or the "National Religious" community (and also Modern Orthodox in US terms), as well as what has become known over the past decade or so as Hardal (Haredi-Leumi, i. e., "ultra-Orthodox nationalist"), which combines a largely Haredi lifestyle with a nationalist (i. e., pro-Zionist) ideology. 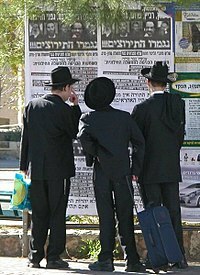 Haredi applies to a populace that can be roughly divided into three separate groups along both ethnic and ideological lines: (1) "Lithuanian" (i. e., non-Hasidic) Haredim of Ashkenazic (i. e., "Germanic" - European) origin; (2) Hasidic Haredim of Ashkenazic (mostly of Eastern European) origin; and (3) Sephardic (including mizrahi) Haredim. There is also a growing baal teshuva (Jewish returners) movement of secular Israelis rejecting their previously secular lifestyles and choosing to become religiously observant, with many educational programs and yeshivas for them. An example is Aish HaTorah, which received open encouragement from some sectors within the Israeli establishment. Conservative Judaism and Reform Judaism are represented among Israeli Jews. According to The Israel Democracy Institute, as of 2013, approximately 8 percent of Israel’s Jewish population "identified" with Reform and Conservative Judaism, a study by Pew Research Center showed 5% did, while a Midgam survey showed that one third "especially identified with Progressive Judaism", almost as many as those who especially identify with Orthodox Judaism. The Chief Rabbinate strongly opposes the Reform and Conservative movements, saying they are "uprooting Judaism", that they cause assimilation and that they have “no connection” to authentic Judaism. The chief rabbinate's view does not reflect the majority viewpoint of Israeli Jews, however. A survey of Israeli Jews published in May 2016 showed that 72 percent of respondents said they disagreed with the Haredi assertions that Reform Jews are not really Jewish. The survey also showed that a third of Israeli Jews "identify" with progressive (Reform or Conservative) Judaism and almost two thirds agree that Reform Judaism should have equal rights in Israel with Orthodox Judaism. The report was organized by the Israel Movement for Reform and Progressive Judaism ahead of its 52nd biennial conference. While the state of Israel enables freedom of religion for all of its citizens, it does not enable civil marriage. The state forbids and disapproves of any civil marriages or non-religious divorces performed amongst within the country. Because of this, some Israelis choose to marry outside of Israel. Many parts of the "status quo" have been challenged by secular Israelis regarding the Chief Rabbinate's strict control over Jewish weddings, Jewish divorce proceedings, conversions, and the question of who is a Jew for the purposes of immigration. On the other hand, secular Israelis began questioning whether a "status quo" based on the conditions of the 1940s and 1950s was still relevant in the 1980s and 1990s, and reckoned that they had cultural and institutional support to enable them to change it regardless of its relevance. They challenged Orthodox control of personal affairs such as marriage and divorce, resented the lack of entertainment and transportation options on the Jewish Sabbath (then the country's only day of rest), and questioned whether the burden of military service was being shared equitably, since the 400 scholars who originally benefited from the exemption, had grown to 50,000. Finally, the Progressive and Conservative communities, though still small, began to exert themselves as an alternative to the Haredi control of religious issues. No one was happy with the "status quo"; the Orthodox used their newfound political force to attempt to extend religious control, and the non-Orthodox sought to reduce or even eliminate it. In 2010 a report released by the Israel Central Bureau of Statistics showed that 8% of Israel's Jewish population defines itself as ultra-Orthodox, 12% as Orthodox, 13% as traditional-religious, 25% as traditional, and 42% as secular, on a descending scale of religiosity. Among the Arab population it showed that 8% define themselves as very religious, 47% as religious, 27% as not very religious, and 18% as not religious. It was during the British Mandate of Palestine that the British administration established an official dual Ashkenazi-Sephardi "Chief Rabbinate" (rabbanut harashit) that was exclusively Orthodox, as part of an effort to consolidate and organize Jewish life based on its own model in Britain, which encouraged strict loyalty to the British crown, and in order to attempt to influence the religious life of the Jews in Palestine in a similar fashion. In 1921, Rabbi Abraham Isaac Kook (1864–1935) was chosen as the first Ashkenazi Chief Rabbi and Rabbi Jacob Meir as the first Sephardi Chief Rabbi (Rishon LeTzion). Rabbi Kook was a leading light of the religious Zionist movement, and was acknowledged by all as a great rabbi of his generation. He believed that the work of secular Jews toward creating an eventual Jewish state in Eretz Yisrael was part of a divine plan for the settlement of the land of Israel. The return to Israel was in Kook's view not merely a political phenomenon to save Jews from persecution, but an event of extraordinary historical and theological significance. Prior to the 1917 British conquest of Palestine, the Ottomans had recognized the leading rabbis of the Old Yishuv as the official leaders of the small Jewish community that for many centuries consisted mostly of the devoutly Orthodox Jews from Eastern Europe as well as those from the Levant who had made aliyah to the Holy Land, primarily for religious reasons. The European immigrants had unified themselves in an organization initially known as the Vaad Ha'ir, which later changed its name to Edah HaChareidis.The Turks viewed the local rabbis of Palestine as extensions of their own Orthodox Hakham Bashis ("[Turkish] Chief Rabbi/s") who were loyal to the Sultan. Thus the centrality of an Orthodox dominated Chief Rabbinate became part of the new state of Israel as well when it was established in 1948.Based in its central offices at Heichal Shlomo in Jerusalem the Israeli Chief rabbinate has continued to wield exclusive control over all the Jewish religious aspects of the secular state of Israel. Through a complex system of "advice and consent" from a variety of senior rabbis and influential politicians, each Israeli city and town also gets to elect its own local Orthodox Chief Rabbi who is looked up to by substantial regional and even national religious and even non-religious Israeli Jews. Through a national network of Batei Din ("religious courts"), each headed only by approved Orthodox Av Beit Din judges, as well as a network of "Religious Councils" that are part of each municipality, the Israeli Chief Rabbinate retains exclusive control and has the final say in the state about virtually all matters pertaining to conversion to Judaism, the Kosher certification of foods, the status of Jewish marriages and divorces, and monitoring and acting when called upon to supervise the observance of some laws relating to Shabbat observance, Passover (particularly when issues concerning the sale or ownership of Chametz come up), the observance of the Sabbatical year and the Jubilee year in the agricultural sphere. The Israel Defense Forces also relies on the Chief Rabbinate's approval for its own Jewish chaplains who are exclusively Orthodox. The IDF has a number of units that cater to the unique religious requirements of the Religious Zionist yeshiva students through the Hesder program of combined alternating military service and yeshiva studies over several years. A poll conducted by the Israel Democracy Institute in April and May 2014 of which institutions were most and least trusted by Israeli citizens showed that Israelis have little trust in the religious establishment. When asked which public institutions they most trusted, the Chief Rabbinate at 29% was one of the least trusted. The Karaites are an ancient Jewish community that practices a form of Judaism distinct from Rabbinical Judaism, dating ostensibly to between the 7th and 9th centuries based on textual evidence, though they claim a tradition at least as old as other forms of Judaism with some tracing their origins to the Masoretes and the Sadducees. Once making up a significant proportion[clarification needed] of the Jewish population, they are now an extreme minority compared to Rabbinical Judaism. Nearly the entirety of their population, between 30,000 and 50,000, currently live in Israel, and reside mainly in Ramla, Ashdod and Beer-Sheva. There are an estimated 10,000 additional Karaites living elsewhere around the world, mainly in the United States, Turkey, Poland, and elsewhere in Europe. Israel is home to the only significant populations of Samaritans in the world. As of November 1, 2007, there were 712 Samaritans. 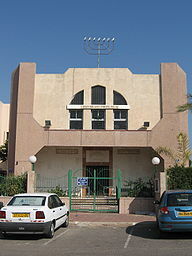 The community lives almost exclusively in Kiryat Luza on Mount Gerizim and in Holon. Their traditional religious leader is the Samaritan High Priest, currently Aabed-El ben Asher ben Matzliach. Ancestrally, they claim descent from a group of Israelite inhabitants from the tribes of Joseph (divided between the two "half tribes" of Ephraim and Manasseh), and the priestly tribe of Levi. Despite being counted separately in the census, for the purposes of citizenship, the Israeli Chief Rabbinate has classified them as Jews according to law. 9th Station of the Cross on the Via Dolorosa street in Jerusalem. The Church of the Holy Sepulchre in the background is venerated by Christians as the site of the Burial and Resurrection of Jesus. Most Christians living permanently in Israel are Arabs, or have come from other countries to live and work mainly in churches or monasteries, which have long and enduring histories in the land. Ten churches are officially recognized under Israel's confessional system, which provides for the self-regulation of status issues, such as marriage and divorce. These are the Roman (Latin rite), Armenian, Syriac, Chaldean, Melkite (Greek Catholic) and Maronite Catholic churches, Eastern Orthodox Greek Orthodox Church, and Syriac Orthodox churches, as well as Anglicanism. Christian Arabs are one of the most educated groups in Israel. Maariv has described the Christian-Arab sector as "the most successful in the education system", since Christian Arabs fared the best in terms of education in comparison to any other group receiving an education in Israel. Arab Christians were also the vanguard in terms of eligibility for higher education, and they have attained bachelor's and academic degrees at higher rates than Jews, Druze or Muslims in Israel. According to historical and traditional sources, Jesus lived in the Land of Israel, and died and was buried on the site of the Church of the Holy Sepulchre in Jerusalem, making the land a Holy Land for Christianity. However, few Christians now live in the area, compared to Muslims and Jews. This is because Islam displaced Christianity in almost all of the Middle East, and the rise of modern Zionism and the establishment of the State of Israel has seen millions of Jews migrate to Israel. Recently, the Christian population in Israel has increased with the immigration of foreign workers from a number of countries, and the immigration of accompanying non-Jewish spouses in mixed marriages. Numerous churches have opened in Tel Aviv. 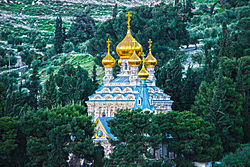 Russian Orthodox Church of Mary Magdalene in Jerusalem. Most Christians in Israel belong primarily to branches of the Eastern Orthodox and Roman Catholic churches that oversee a variety of church buildings, monasteries, seminaries, and religious institutions all over the land, particularly in Jerusalem. Protestant Christians account for less than one percent of Israeli citizens, but foreign evangelical Protestants are a prominent source of political support for the State of Israel (see Christian Zionism). Each year hundreds of thousands of Protestant Christians come as tourists to see Israel. Messianic Judaism is a religious movement that incorporates elements of Judaism with the tenets of Christianity. They worship God the Father as one person of the Trinity. They worship Jesus, whom they call "Yeshua". Messianic Jews believe that Jesus is the Messiah. They emphasise that Jesus was a Jew, as were his early followers. Most adherents in Israel reject traditional Christianity and its symbols, in favour of celebrating Jewish festivals. Although followers of Messianic Judaism are not considered Jews under Israel's Law of Return, there are an estimated 10,000 adherents in the State of Israel, both Jews and other non-Arab Israelis, many of them recent immigrants from the former Soviet Union. In Jerusalem, there are twelve Messianic congregations[not in citation given]. On 23 February 2007, Israel Channel 2 News released a news documentary about the growing number of Messianic Jews in Israel. In Israel Jewish Christians themselves, go by the name Meshiykhiyyim (from Messiah, as found in the Franz Delitzsch Hebrew New Testament) rather than the traditional Talmudic name for Christians Notzrim (from Nazarene). Jerusalem is a city of major religious significance for Muslims worldwide. After capturing the Old City of Jerusalem in 1967, Israel found itself in control of Mount Moriah, which was the site of both Jewish temples and Islam's third holiest site, after those in Mecca and Medina in Saudi Arabia: The Haram al Sharif (Temple Mount) from which Muslims believe that Mohammad ascended to Heaven. This mountain, which has the Dome of the Rock and the adjacent Al-Aqsa Mosque on it, is the third-holiest site in Islam (and the holiest in Judaism). Since 1967, the Israeli government has granted authority to a Waqf to administer the area. Rumors that the Israeli government are seeking to demolish the Muslim sites have angered Muslims. 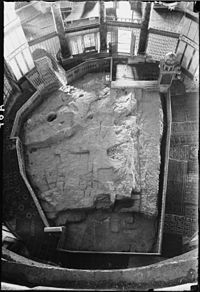 These beliefs are possibly related to excavations that have been taking place close to the Temple Mount, with the intention of gathering archeological remnants of the first and second temple period, as well as the stance of some rabbis and activists who call for its destruction to replace it with the Third Temple. Most Muslims in Israel are Sunni Arabs with a small minority of Ahmadi Arabs. From 1516 to 1917, the Sunni Ottoman Turks ruled the areas that now include Israel. Their rulership reinforced and ensured the centrality and importance of Islam as the dominant religion in the region. The conquest of Palestine by the British in 1917 and the subsequent Balfour Declaration opened the gates for the arrival of large numbers of Jews in Palestine who began to tip the scales in favor of Judaism with the passing of each decade. However, the British transferred the symbolic Islamic governance of the land to the Hashemites based in Jordan, and not to the House of Saud. The Hashemites thus became the official guardians of the Islamic holy places of Jerusalem and the areas around it, particularly strong when Jordan controlled the West Bank (1948–1967). In 1922 the British had created the Supreme Muslim Council in the British Mandate of Palestine and appointed Amin al-Husayni (1895–1974) as the Grand Mufti of Jerusalem. The council was disbanded by Jordan in 1951. Israeli Muslims are free to teach Islam to their children in their own schools, and there are a number of Islamic universities and colleges in Israel and the territories. Islamic law remains the law for concerns relating to, for example, marriage, divorce, inheritance and other family matters relating to Muslims, without the need for formal recognition arrangements of the kind extended to the main Christian churches. Similarly Ottoman law, in the form of the Mecelle, for a long time remained the basis of large parts of Israeli law, for example concerning land ownership. Ahmadiyya is a small Islamic sect in Israel. The history of the Ahmadiyya Muslim Community in Israel begins with a tour of the Middle East in 1924 made by the second caliph of the Community Mirza Basheer-ud-Din Mahmood Ahmad and a number of missionaries. However, the Community was first established in the region in 1928, in what was then the British Mandate of Palestine. The first converts to the movement belonged to the Odeh tribe who originated from Ni'lin, a small village near Jerusalem. In the 1950s they settled in Kababir, a former village which was later absorbed by the city of Haifa. The neighbourhood's first mosque was built in 1931, and a larger one, called the Mahmood Mosque, in the 1980s. Israel is the only country in the Middle East where Ahmadi Muslims can openly practice their Islamic faith. As such, Kababir, a neighbourhood on Mount Carmel in Haifa, Israel, acts as the Middle Eastern headquarters of the Community. It is unknown how many Israeli Ahmadis there are, although it is estimated there are about 2,200 Ahmadis in Kababir. Israel is home to about 102,000 Druze who follow their own gnostic religion. Self described as "Ahl al-Tawhid", and "al-Muwaḥḥidūn" (meaning "People of Oneness", and "Unitarians", respectively), the Druze live mainly in the Haifa area, Acre and Peki'in. Since 1957, the Israeli government has also designated the Druze a distinct ethnic community, at the request of the community's leaders. Until his death in 1993, the Druze community in Israel was led by Shaykh Amin Tarif, a charismatic figure regarded by many within the Druze community internationally as the preeminent religious leader of his time. 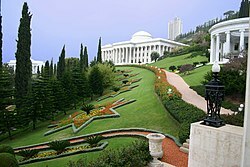 The Bahá'í Faith has its administrative and spiritual centre in Haifa on land it has owned since Bahá'u'lláh's imprisonment in Acre in the early 1870s by the Ottoman Empire. The progress of these properties in construction projects was welcomed by the mayor of Haifa Amram Mitzna (1993–2003). As far back as 1969 a presence of Bahá'ís was noted mostly centered around Haifa in Israeli publications. Several newspapers in Israel since then have noted the presence of Bahá'ís in the Haifa area of some 6-700 volunteers with no salaries, getting only living allowances and housing, and that if an Israeli citizen were to wish to convert they would be told that "the religion does not seek or accept converts in the State of Israel" and that if they persist it is a personal matter between them and God and not a matter of joining a community of believers. Bahá'ís generally practice a "staunch political quietism" and "do not engage in any missionary activity in Israel". Even Bahá'ís from outside Israel are instructed to not "teach" the religion to citizens of Israel. The religion's situation in Israel was specified in an agreement signed in 1987 by then Vice-Premier and Foreign Minister, Shimon Peres as a "recognized religious community in Israel", that the "holiest places of the Bahá'í Faith, … are located in Israel, and confirms that the Universal House of Justice is the Trustee of the Bahá'í International Community over the Holy Places of the Bahá'í Faith in Israel and over the Bahá’í endowments in Israel". As such, self-identifying as Bahá'ís have been noted in Israel: in 1990 World Christian Encyclopedia estimated there were 9500 Bahá'ís; in 2000 near 14,000 were reported, and they continue to grow. Bahá'ís from other countries, wishing to visit Israel, are required to seek written permission from the Universal House of Justice prior to their visit for Bahá'í pilgrimage. The small Hindu community in Israel is mostly made up of representatives of the International Society for Krishna Consciousness. In 2002, most of the devotees lived in Katzir-Harish. Although the exact number of adherents are unknown (one old estimate was 150 total), primarily due to societal stigma and persecution, a growing number of young Israelis are secretly reviving the pre-Judaic polytheistic worship of ancient Canaanite gods known as Semitic neopaganism. Additionally, others worship in different neopagan traditions such as Celtic, Norse, and Wiccan. Jerusalem plays an important role in three monotheistic religions — Judaism, Christianity, and Islam - and Haifa and Acre play a role in a fourth - Baha'i. Mount Gerizim is a holy site to what can be considered a fifth - Samaritanism. The 2000 Statistical Yearbook of Jerusalem lists 1204 synagogues, 158 churches, and 73 mosques within the city. Despite efforts to maintain peaceful religious coexistence, some sites, such as the Temple Mount, have been a continuous source of friction and controversy. Jerusalem has been sacred to the Jews since the 10th century BC. The Western Wall, a remnant of the Second Temple, is a holy site for Jews, second only to the Temple Mount itself. Christianity reveres Jerusalem not only for its role in the Old Testament but also for its significance in the life of Jesus. The land currently occupied by the Church of the Holy Sepulchre is considered one of the top candidates for Golgotha and thus has been a Christian pilgrimage site for the past two thousand years. In 1889, the Ottoman Empire allowed the Catholic Church to re-establish its hierarchy in Palestine. Other ancient churches, such as the Greek, Armenian, Syrian, and Coptic churches are also well represented in Jerusalem. 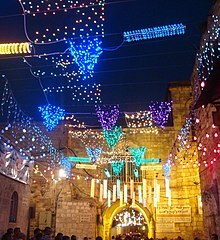 Despite not being explicitly mentioned in the Quran, Jerusalem is the third-holiest city in Islam, after Mecca and Medina. The Temple Mount is topped by two Islamic landmarks intended to commemorate the event — al-Aqsa Mosque, derived from the name mentioned in the Quran, and the Dome of the Rock, which stands over the Foundation Stone, from which Muslims believe Muhammad ascended to Heaven. As for the importance of Haifa and Acre in Baha'i Faith, it is related to Bahá'u'lláh, who was imprisoned in Acre and spent his final years there. Mount Gerizim is the holiest site to Samaritans, who used it as the site of their temple. The State of Israel generally respects freedom of religion. Freedom House reports: "Freedom of religion is respected. Each community has jurisdiction over its own members in matters of marriage, burial, and divorce." Religious tensions exist between Jewish haredi and non-haredi Israeli Jews. Haredi Israeli males devote their young adulthood to full-time Talmudic studies and therefore generally get exemptions from military service in the Israel Defense Forces. Many leaders of haredi Judaism encourage these students to apply for exemptions from the mandatory army service, ostensibly to protect them from the secularizing influence of the Israeli army. Over the years, the number of exemptions has grown to about 10% of conscriptable manpower. Many secular Israelis consider these exemptions to be a systematic shirking of their patriotic duty by a large segment of society. Haredi Israelis are represented by haredi political parties, which like all smaller parties in a system of proportional representation may tend to wield disproportionate political power at the point when government coalitions need to be negotiated following national elections. As of June 2008[update], the two main Haredi parties in the Knesset are Shas, representing Sephardi and Mizrahi interests, and United Torah Judaism, an alliance of Degel HaTorah (Lithuanian Haredi) and Agudath Yisrael. The Shinui party was created as a backlash to the perceived influence of the haredi parties, and to represent the interests of secular Jews that supposedly were not seen to by the other non-religious parties. Tension also exists between the Orthodox establishment and the Conservative and Reform movements. Only Orthodox Judaism is officially recognized in Israel (though conversions conducted by Conservative and Reform clergy outside of Israel may be accepted for the purposes of the Law of Return). As a result, Conservative and Reform synagogues receive minimal government funding and support. Conservative and Reform rabbis cannot officiate at religious ceremonies and any marriages, divorces, and conversions they perform are not considered valid. Conservative and Reform Jews have been prohibited from holding services at the Western Wall on the grounds that they violate Orthodox norms regarding participation of women. Tensions exist surrounding Mehadrin bus lines, a type of bus line in Israel which mostly runs in and/or between major Haredi population centers, in which gender segregation are applied. Non-Haredi female passengers have complained of being harassed and forced to sit at the back of the bus. In a ruling of January 2011, the Israeli High Court of Justice stated the unlawfulness of gender segregation and abolished the “mehadrin” public buses. However, the court rule allowed the continuation of the gender segregation in public buses on a strictly voluntary basis for a one-year experimental period. Messianic Jews who are members of Messianic congregations are among the most active missionary movements in Israel. Their proselytising has faced demonstrations and intermittent protests by the Haredi anti-missionary group Yad LeAchim, which infiltrates those movements, as well as other proselytising groups including Hare Krishna and Scientology, and maintains extensive records on their activities. Attempts by Messianic Jews to evangelize other Jews are seen by many religious Jews as incitement to "avodah zarah" (foreign worship or idolatry). Over the years there have been several arson attempts of messianic congregations. There have also been attacks on Messianic Jews and hundreds of New Testaments distributed in Or Yehuda were burned. While missionary activity itself is not illegal in Israel, it is illegal to offer money or other material inducements. Legislation banning missionary work outright has been attempted in the past. Some Orthodox Jewish communities in Israel have come under scrutiny for the negative stereotyping and scapegoating of Christian minorities in the region, including violent acts against Christian missionaries and communities. A frequent complaint of Christian clergy in Israel is being spat at by Jews, often haredi yeshiva students. The Anti-Defamation League has called on the chief Rabbis to speak out against interfaith assaults. In January 2010, Christian leaders, Israeli Foreign ministry staff, representatives of the Jerusalem municipality and the Haredi community met to discuss the problem. The Haredi Community Tribunal of Justice published a statement condemning the practice, stating that it was a "desecration of God's name". Several events were planned in 2010 by the liberal Orthodox Yedidya congregation to show solidarity with Christians and improve relations between the Haredi and Christian communities of Jerusalem. Currently, Israel issues marriage licenses if performed under an official religious authority (whether it be Orthodox Jewish, Christian, Muslim, Druze, etc.) only between a man and a woman of the same religion. Civil marriages were officially sanctioned only if performed abroad, but 2010 changes in Israeli law allow secular marriage in Israel for people that have proven to lack any religion also. This is a major issue among secular groups, as well as adherents to non-Orthodox streams of Judaism. There is fear that civil marriage will divide the Jewish people in Israel between those who can marry Jews and those who cannot, leading to concerns over retaining the character of the Jewish state. ^ a b c "Statistical Abstract of Israel 2017". Central Bureau of Statistics. ^ a b "Table 2.1 — Population, by Religion and Population. As of may 2011 estimate the population was 76.0 Jewish. Group". Statistical Abstract of Israel 2006 (No. 57). Israel Central Bureau of Statistics. 2006. Archived from the original (PDF) on 2012-09-14. ^ a b "Israel and the Occupied Territories". U.S. Department of State. ^ Sheetrit, Shimon (2001-08-20). "Freedom of Religion in Israel". Israel Ministry of Foreign Affairs. Archived from the original on 6 February 2013. Retrieved 2008-10-26. ^ a b "Freedom of Religion in Israel". www.jewishvirtuallibrary.org. Retrieved 2017-05-16. ^ "Proclamation of Independence". 14 May 1948. The catastrophe which recently befell the Jewish people - the massacre of millions of Jews in Europe - was another clear demonstration of the urgency of solving the problem of its homelessness by re-establishing in Eretz-Israel the Jewish State, which would open the gates of the homeland wide to every Jew and confer upon the Jewish people the status of a fully privileged member of the community of nations. ^ Prof. Raphael Cohen-Almagor. "Israel and International Human Rights" (PDF). The Center for Democratic Studies at the University of Haifa. ^ Nicole Maor. "The Law of Return – is it time for the Return of the Law?". Retrieved October 29, 2018. ^ "A Portrait of Israeli Jewry: Beliefs, Observances, and Values among Israeli Jews 2000" (PDF). The Israel Democracy Institute and The AVI CHAI Foundation. 2002. p. 8. Archived from the original (PDF) on 30 June 2007. Retrieved 2008-01-28. ^ "Top 50 Countries With Highest Proportion of Atheists / Agnostics". Adherents.com. 27 March 2005. ^ "Survey: Record Number of Israeli Jews Believe in God". Haaretz.com. ^ Moti Bassok (25 December 2007). "Central Bureau of Statistics: 2.1% of state's population is Christian". HAARETZ.com. Retrieved 2008-01-29. ^ "Population, by Population Group" (PDF). Monthly Bulletin of Statistics. Israel Central Bureau of Statistics. 31 December 2013. Archived from the original (PDF) on 2014-02-03. Retrieved 17 Feb 2014. ^ "Population of Israel on the eve of 2016". Press Release. Israel Central Bureau of Statistics. 31 December 2015. Archived from the original on 9 January 2016. Retrieved 2 January 2016. ^ Daniel J. Elazar. "How Religious are Israeli Jews?". Jerusalem Center for Public Affairs. Retrieved 2008-01-28. ^ a b Lipka, Michael (March 15, 2016). "Unlike U.S., few Jews in Israel identify as Reform or Conservative". Pew Research Center. ^ "Poll Shows Ranks of Secular Jewish Minority in Israel Continued to Drop in 2009". Haaretz.com. ^ By JEREMY SHARON, SAM SOKOL (February 25, 2016). "Chief Rabbinate in fierce attack on Reform, Conservative movements". Jerusalem Post. Retrieved April 27, 2016. ^ Survey: Majority of Israeli Jews support equality for Reform movement JTA, May 27, 2016. ^ "Israel 2010: 42% of Jews are secular". ynet. McMahon, Arthur. L. (1913). "Holy Sepulchre" . In Herbermann, Charles (ed.). Catholic Encyclopedia. New York: Robert Appleton Company. ^ a b c "Christians in Israel: Strong in education". ynet. ^ Zylstra, Sarah. "Israeli Christians Think and Do Almost the Opposite of American Evangelicals". Christianity Today. Retrieved 24 February 2018. ^ Daphna Berman. "Aliyah with a cat, a dog and Jesus". WorldWide Religious News citing & quoting "Haaretz", 10 June 2006. Archived from the original on 17 January 2008. Retrieved 2008-01-28. ^ Larry Derfner and Ksenia Svetlova. "Messianic Jews in Israel claim 10,000". rickcross.com, citing & quoting Jerusalem Post 29 April 2005. Retrieved 2008-01-28. ^ "Messianic perspectives for Today". leeds Messianic fellowship. Retrieved 2008-01-28. ^ example: The Christian Church, Jaffa Tel-Aviv website article in Hebrew Archived 2011-09-04 at the Wayback Machine יהודים משיחיים - יהודים או נוצרים? ^ "The Destruction of the Temple Mount Antiquities, by Mark Ami-El". 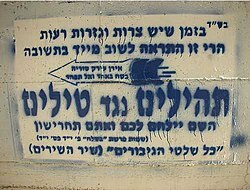 ^ "J'lem posters call for 3rd Temple". The Jerusalem Post - JPost.com. ^ Ori Stendel (1996). The Arabs in Israel. Sussex Academic Press. p. 45. ISBN 978-1898723240. Retrieved June 2, 2014. ^ "Kababir and Central Carmel – Multiculturalism on the Carmel". Retrieved February 17, 2015. ^ "Kababir". Israel and You. Archived from the original on January 30, 2015. Retrieved February 17, 2015. ^ Pace, Eric (1993-10-05). "Sheik Amin Tarif, Arab Druse Leader In Israel, Dies at 95". The New York Times. Retrieved 2010-03-29. ^ a b c Adam Berry (September 22, 2004). "The Bahá'í Faith and its relationship to Islam, Christianity, and Judaism: A brief history". International Social Science Review. ISSN 0278-2308. Retrieved March 5, 2015. ^ Zev Vilnay; Karṭa (Firm) (1969). The new Israel atlas: Bible to present day. Israel Universities Press. p. 38. ^ * Nechemia Meyers (1995). "Peace to all nations - Baha'is Establish Israel's Second Holy Mountain". The World & I. Retrieved Mar 5, 2015. ^ a b c Donald H. Harrison (April 3, 1998). "The Fourth Faith". Jewish Sightseeing. Haifa, Israel. Retrieved Mar 5, 2015. ^ Universal House of Justice (Jan 13, 2015). "Humanitarian Responses to Global Conflicts". Letters from the Universal House of Justice. Bahai-Library.com. Retrieved March 5, 2015. ^ "Teaching the Faith in Israel". Bahá'í Library Online. 1995-06-23. Retrieved 2007-08-06. ^ Universal House of Justice (April 30, 1987). "Regarding the development of the properties of the Bahá'í World Centre". Bahá'í Reference Library, Selected Messages of the Universal House of Justice. Bahá'í International Community. Retrieved December 25, 2016. ^ "Other visits to the Holy Land". Bahá'í World Centre. Archived from the original on 2011-01-04. Retrieved 2010-03-24. ^ "What is the Western Wall?". The Kotel. Archived from the original on 2007-02-02. Retrieved 2007-03-06. ^ "The Early Arab Period - 638-1099". Jerusalem: Life Throughout the Ages in a Holy City. Bar-Ilan University Ingeborg Rennert Center for Jerusalem Studies. March 1997. Retrieved 2007-04-24. ^ "Egged launches 11 'mehadrin' bus lines". Jerusalem Post. December 1, 2006. Archived from the original on July 6, 2013. Retrieved 2011-03-08. ^ Izenberg, Dan; Mandel, Jonah (January 6, 2011). "Court scraps 'mehadrin' buses". Jerusalem Post. Retrieved 2011-03-08. ^ Elaine Ruth Fletcher (26 June 2000). "Orthodox Suspected in Jerusalem Conservative Synagogue, Church Attacks". beliefnet.com. Retrieved 2007-01-28. ^ Larry Derfner (29 April 2005). "A matter of faith". The Jerusalem Post. ^ Barkat, Amiram (2009-06-27). "Christians in Jerusalem want Jews to stop spitting on them". Haaretz. ^ "ADL Calls On Chief Rabbis to Speak Out Against Interfaith Assaults In Old City". 2004-10-17. Archived from the original on 2008-11-29. ^ "Israeli couple become first to be wed in civil union". The Jerusalem Post - JPost.com. ^ Fleet, Josh (2010-11-04). "Israel To Allow Civil Marriages". Huffington Post. ^ "Statistical Abstract of Israel 2014 - No. 65 Subject 2 - Table No. 2". ^ The Jerusalem Law states that "Jerusalem, complete and united, is the capital of Israel" and the city serves as the seat of the government, home to the President's residence, government offices, supreme court, and parliament. United Nations Security Council Resolution 478 (20 August 1980; 14–0, U.S. abstaining) declared the Jerusalem Law "null and void" and called on member states to withdraw their diplomatic missions from Jerusalem. The United Nations and all member nations refuse to accept the Jerusalem Law (see Kellerman 1993, p. 140) and maintain their embassies in other cities such as Tel Aviv, Ramat Gan, and Herzliya (see the CIA Factbook and Map of Israel). 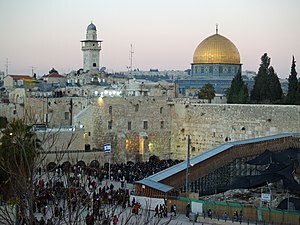 The U.S. Congress subsequently adopted the Jerusalem Embassy Act, which said that the U.S. embassy should be relocated to Jerusalem and that it should be recognized as the capital of Israel. However, the US Justice Department Office of Legal Counsel concluded that the provisions of the act "invade exclusive presidential authorities in the field of foreign affairs and are unconstitutional". Since passage of the act, all Presidents serving in office have determined that moving forward with the relocation would be detrimental to U.S. national security concerns and opted to issue waivers suspending any action on this front. The Palestinian Authority sees East Jerusalem as the capital of a future Palestinian state. The city's final status awaits future negotiations between Israel and the Palestinian Authority (see "Negotiating Jerusalem", Palestine–Israel Journal). See Positions on Jerusalem for more information.